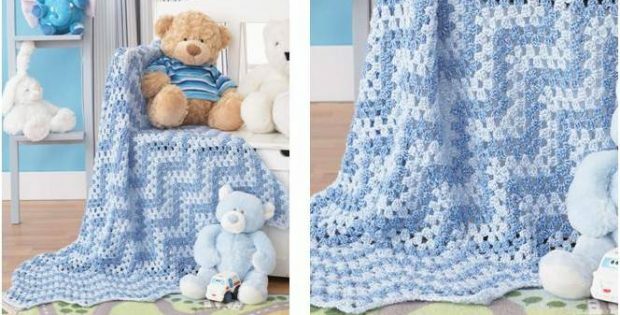 This comfy and cozy Granny Waves Crocheted Blanket will keep your baby feeling warm and pampered. The vibrant and cheery design will perk up your baby’s space! It also makes for a wonderful gift to bring to baby showers! In fact, this pattern is perfect for experienced beginners and intermediate crocheters looking to add more baby items to their list of crocheted projects. Once completed, the crocheted baby blanket should measure approximately 38 inches by 38 inches. In metric units, the finished baby blanket should be about 96.5 cm by 96.5 cm in size. This beautifully crafted crocheted baby blanket is another design by the creatives over at Yarnspirations. You can access the downloadable pattern for this lovely crochet baby blanket. To access the downloadable pattern for this comfy baby blanket, please click on this link: Granny Waves Blanket Pattern.